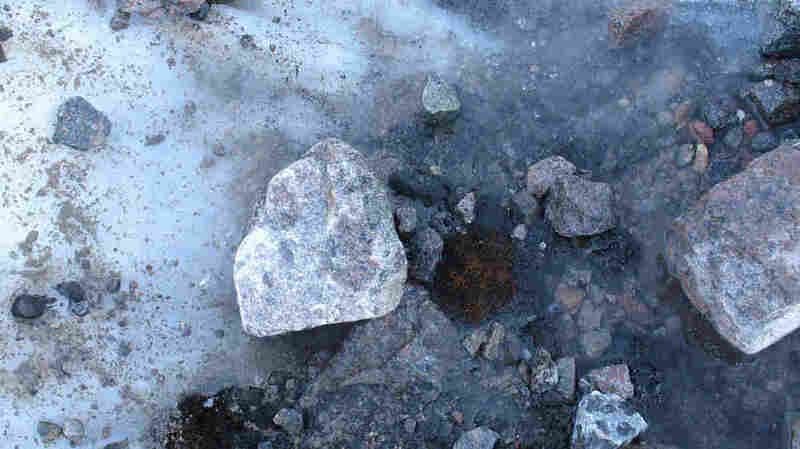 Beneath A Glacier's White, Researchers See Green : The Two-Way Underneath a receding glacier in the Canadian Arctic, researchers found something surprising: a kind of plant related to moss that was not only still green, but also growing. As the Teardrop Glacier on Ellesmere Island in the Canadian Arctic recedes, researchers have found a kind of evergreen plant called bryophytes coming out from beneath the ice. 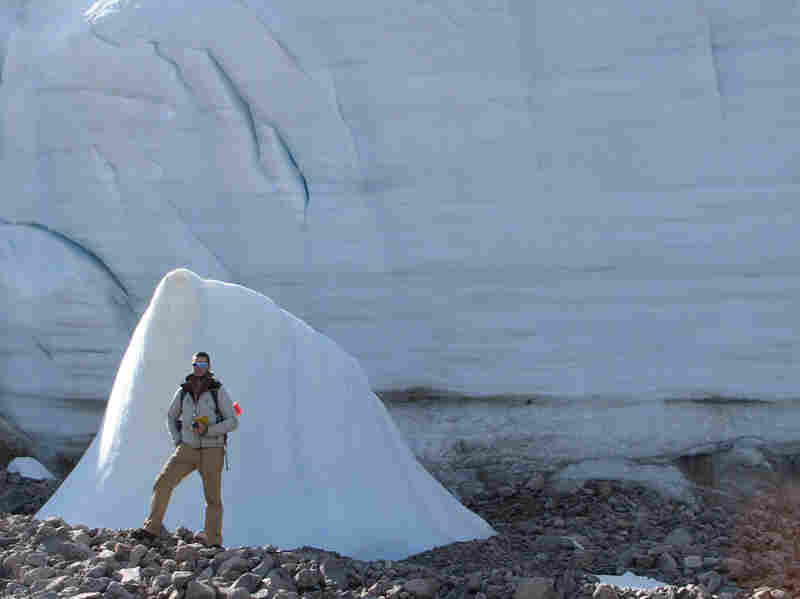 Here, a researcher stands next to part of the glacier for scale. In the news business, an evergreen is a story that doesn't have to run on a particular day, but can stay fresh for a long time. This is an evergreen story about an evergreen. In particular, a group of plants called bryophytes. Turns out they may be evergreen quite a bit longer than most people thought. The most famous bryophyte of them all is moss. "After a hundred years, a moss may look perfectly natural and even retain its green color," says Jonathan Shaw, a scientist at the bryology lab at Duke University. But a hundred years is nothing compared with the bryophytes Catherine La Farge and her colleagues found on Ellesmere Island in the Canadian Arctic. The Teardrop Glacier on Ellesmere Island has been receding rather rapidly recently. 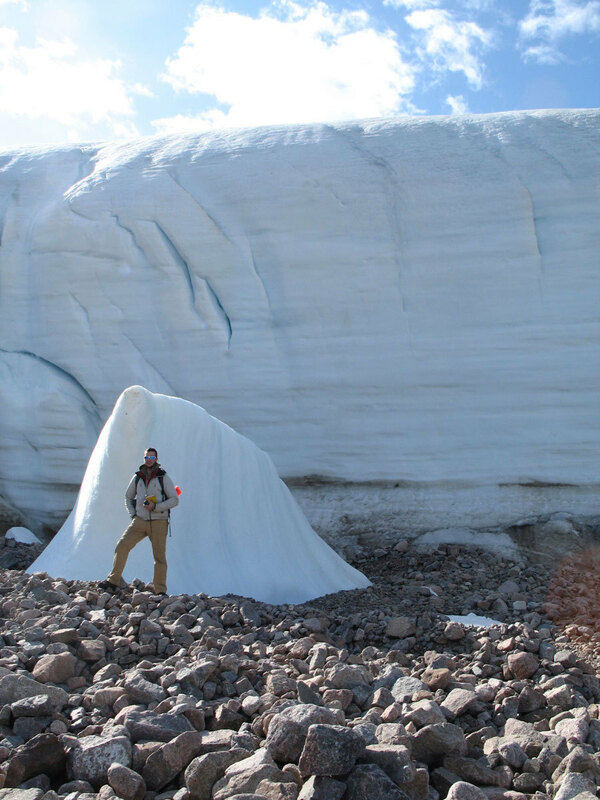 "We were aware that there was vegetation coming out from underneath the glacier," La Farge says. "But we had no idea that there was such a diversity of bryophytes that were coming out from underneath the glacier." The small patch in the middle of the image is Aulacomnium turgidum, a type of bryophyte plant. 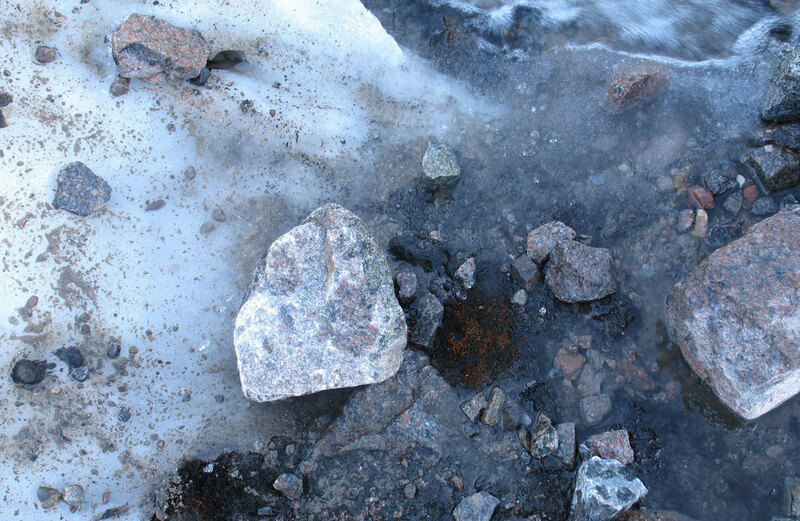 Researchers in the Canadian Arctic say they are surprised the bryophytes were still green, even after being covered by ice. 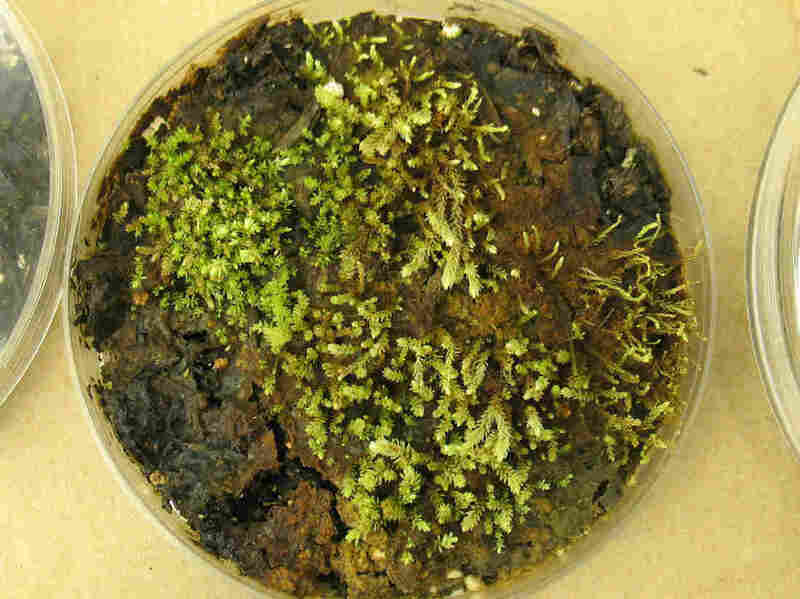 But if the diversity was impressive, even more so was what they saw when they brought the bryophytes back to their laboratory in Edmonton, Alberta. "The material actually looked quite green when we examined it underneath the microscope. And in examining it in more detail, there was actually growth coming from the material," La Farge says. In other words, not only were the plants still green, they were green and growing, something La Farge says is pretty amazing. 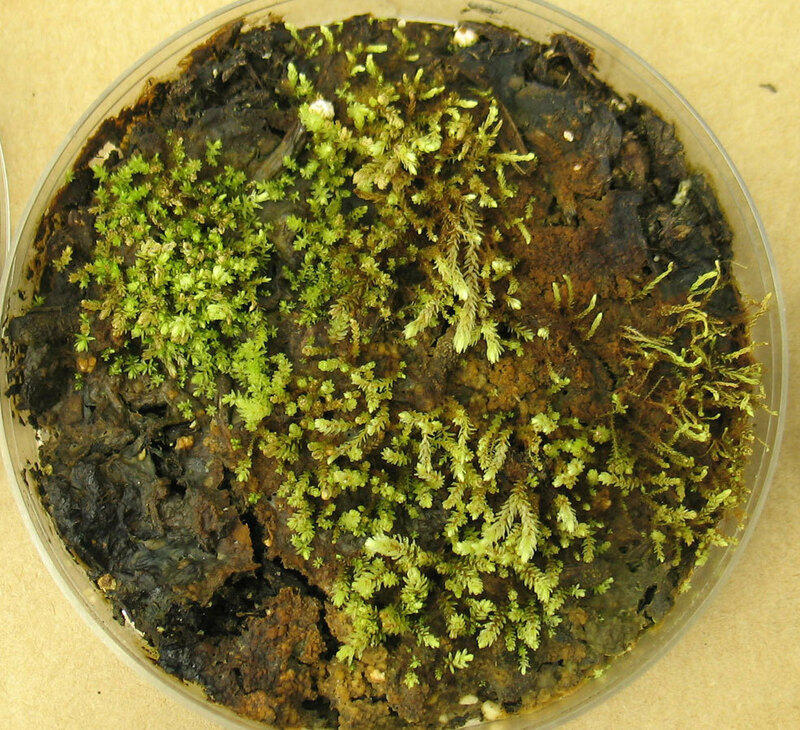 In the lab, scientists grew cultures of some of the plants found beneath the receding Teardrop Glacier. These are Aulacomnium turgidum, a relative of moss. She says bryophytes don't typically get a lot of attention from botanists, compared to the gaudier seed plants most people are familiar with. As La Farge and her colleagues write in the current issue of the journal PNAS, "Our results emphasize the unrecognized resilience of bryophytes, which are commonly overlooked vis-a-vis their contribution to the establishment, colonization and maintenance of polar terrestrial ecosystems." In fact, as glaciers around the world continue to recede, we may be hearing a lot more about bryophytes.